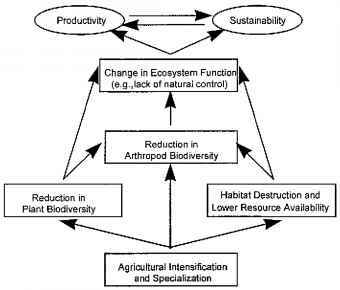 Disturbance can alter the diversity of an ecosystem (Atlas, 1984) directly by affecting survivorship of individuals or indirectly by changing resource levels (Hobbs and Huenneke, 1992). Sometimes, diversity measurements reflect the result of disturbance caused by pollution and/or stress. For example, taxonomic diversity of microinvertebrate communities was less in polluted or disturbed than in unpolluted or undisturbed agricultural sites (Atlas et al., 1991). Pollution eliminates sensitive species, reducing competition so that tolerant species proliferate (Atlas, 1984). Succession can be interrupted at various stages by agricultural practices, such as cultivation and applications of fertilizer and pesticide (Ferris and Ferris, 1974; Wasilewska, 1979). Such interruptions reduce diversity and successional "maturity." Maturity indices are based on the principles of succession and relative sensitivity of various nematode taxa to stress or disruption of the successional sequence (Bongers, 1990). Indices that describe associations within biological communities, such as a maturity index, are less variable than measures of abundance of a single taxonomic or functional group and are, thus, more reliable as measures of ecosystem condition (Neher et al., 1995).